Busan is located at the southeastern part of the Korean Peninsula. It is an international city linking Korea to the rest of the world by it's harbor. During the Korean War served as the Provisional Capital. It was one of the few places never occupied by the North Korean army. The atmoshpere of Busan is that of a true harbor city. The beaches, the prominent harbor and the seaview make it a pleasant city to visit. There are many cultural assets in Busan. Still a lot of tourists will not see more than beaches. Haeundae Beach is Korea's most famous beach. If you want to enjoy it, be prepared because you can walk over heads. A funny aspect of Korean beach culture is that it is almost impossible to find a pretty women in a bikini. They go into the water with more clothes than the average western women. 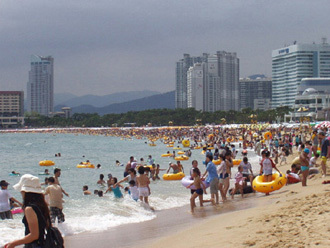 Gwangalli Beach is easily accessible by public transportation. Clean water and gentle streams attract tourists. At night, the beach is a popular destination for young couples. The view on the huge bridge connecting two city sites adds an something extra to the scenery. UN Memorial Cemetery, this Cemetery was built in 1959 to commemorate the UN soldiers who died during the Korean War. It is the only cemetery where several thousand soldiers from the 16 allied nations rest in peace.